(BGO) – The Department of Construction of Bac Giang province held a ceremony to announce a decision of the provincial People’s Committee approving a detailed planning of an industrial, trade, tourism-services and residential complex in Kham Lang and Tien Hung communes and an industrial, trade-services and residential complex in Lan Mau and Yen Son communes in Luc Nam district. The industrial, trade, tourism-services and residential complex in Kham Lang and Tien Hung communes has a total area of 350ha and is designed to accommodate 10,800 people. It can serve around 45,000 tourists. 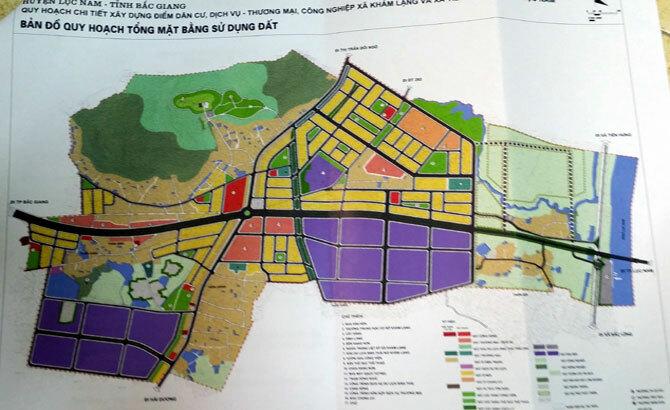 Meanwhile, the industrial, trade-services and residential complex in Lan Mau and Yen Son communes has an area of 371ha, and is designed to house 8,500 people and 25,000 workers. The two complexes will have all basic infrastructural facilities, including internal roads, power supply and water drainage systems, a waste water treatment station, schools, and car parks. The residential area will be greened and contain a lake to improve landscape and weather. A large area will be reserved to build a trade services complex such as groceries, hotels, representative offices and a petrol station. An eco-tourism zone will be built in forest in the industrial, trade, tourism-services and residential complex in Kham Lang and Tien Hung communes in order to attract more tourists. On this occasion, the construction department asked the Luc Nam district People’s Committee and involved departments and offices to implement the planning.